For those that can hardly wait for the massive day of racing on June 6th at Belmont Park, I’ve got good news! 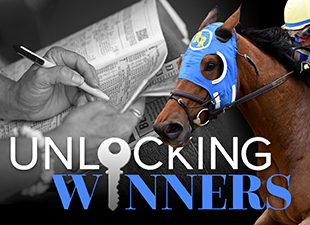 A terrific series of stakes races are scheduled to be held this weekend at tracks across the country, with big-name racehorses like Work All Week, Lady Eli, Divisidero, Ben’s Cat, Moreno, and Ocho Ocho Ocho among the entries. In fact, there are so many great races on the agenda this week that I have decided to handicap four of them in today’s blog post, so without further ado, let’s get started! It may not be the biggest race of the week, but the nine-furlong Pennine Ridge Stakes for three-year-olds on the turf has drawn an exceptional field of eight, including the exciting Divisidero. The son of Kitten’s Joy unleashed an explosive turn-of-foot to win the American Turf Stakes (gr. II) (VIDEO) on Kentucky Derby day, running his final five-sixteenths in about :27 4/5 (is that even possible?!) to win by three-quarters of a length over a colt named A Lot. Now, A Lot ran a winning race in defeat, and further proved his talent when he came back and won the seven-furlong Paradise Creek Stakes at Belmont last Saturday, running the final furlong in just over :11 flat to win by 5 ¾ lengths. Thus, the fact that Divisidero absolutely swallowed him up on Derby day is very impressive indeed! A very good field is set to face Divisidero in the Pennine Ridge, including Takeover Target, who impressively won an 8.5-furlong allowance race (VIDEO) at Belmont on May 7th; World Approval, who finished third by 2 ½ lengths in the American Turf Stakes; Startup Nation, winner of the With Anticipation Stakes (gr. II) (VIDEO) at Saratoga last summer; and Eh Cumpari, who narrowly defeated Divisidero in the Palm Beach Stakes (gr. III) (VIDEO) in March. But at this point in their careers, in a fairly run race, I don’t believe any of these colts can match the finishing speed of Divisidero, and I think we’re going to see another impressive performance from this colt on Saturday. Allow me to preface my analysis of this race by saying that I am about as big a fan of Ben’s Cat as you will ever find. The nine-year-old gelding is nothing short of remarkable, and his record of 29 victories from 47 starts speaks for itself. But as he prepares for the five-furlong Pennsylvania Governor’s Cup, it’s worth noting that he lost this race in both 2013 and 2012, and only won by a neck in 2011. Given that his defeats in this race have been sandwiched by winning efforts, I think it’s fair to wonder if Ben’s Cat isn’t quite as good over the turf course at Penn National as he is over the courses at Pimlico, Parx, and Laurel. With that in mind, I’ll try to beat him with Bold Thunder, who lost by just a neck to Ben’s Cat in the Jim McKay Turf Sprint Stakes (VIDEO) at Pimlico two weeks ago. Although Bold Thunder could only finish third in this race last year, I think he’s in much better form now, and if Ben’s Cat doesn’t bring his best race, I think Bold Thunder has a big chance to steal this race in gate-to-wire fashion. With Strict Compliance skipping this race to run in the Penn Oaks instead, a field of six three-year-old fillies will start in this ten-furlong turf race, including a number of shippers from the East Coast. First and foremost is probably Feathered, a Todd Pletcher-trained filly that score a solid victory in the 8.5-furlong Edgewood Stakes (gr. III) (VIDEO) last time out at Churchill Downs. However, she did benefit from a very easy trip setting slow fractions on the lead, and she might receive a bit more pressure on Saturday from Mrs McDougal and/or Spanish Queen. Another major contender is Consumer Credit, who has finished first or second in each of her last six starts, four of them stakes races. She possesses a very impressive turn-of-foot, and her pedigree and finishing strength at the end of her races suggests that she will be able to handle ten furlongs. However, my choice to win is Spanish Queen, winner of the nine-furlong Honeymoon Stakes (gr. II) (VIDEO) last time out at Santa Anita. In that race, she settled just a couple of lengths behind quick fractions of :23.07 and :46.81, then made a strong run to take command and flew home the final furlong in :11.76 to win impressively. Her proven affinity for the Santa Anita turf course is an advantage, as is the fact that she doesn’t have to ship in for the race, and drawing post two should enable her to work out a great ground-saving trip. I think she has what it takes to pull off an upset over the East Coast shippers. A field of nine will contest this nine-furlong race at Santa Anita, led by grade I winner Moreno. The five-year-old gelding turned in an eye-catching performance last time out to win the Charles Town Classic (gr. II) (VIDEO) by two lengths in the track-record time of 1:48.81, although he did benefit from the fact that heavily-favored Shared Belief was pulled up with an injury. Nine furlongs appears to be his best distance, and we know from his runner-up effort in the Santa Anita Handicap (gr. I) that he can run well at Santa Anita, but it’s worth noting that he has only won four times from 26 starts—in other words, his victories have been few and far between. Since he will likely be a heavy favorite, it might be worth trying to beat him at a short price. Therefore, I’ll take a chance with Catch a Flight, who finished third in the Santa Anita Handicap—just a head behind Moreno—before winning the 8.5-furlong Precisionist Stakes (gr. III) (VIDEO) at Santa Anita on May 2nd. His Beyer speed figures suggest that he will be right in the mix, and his ability to track the pace or settle off the lead should allow him to adapt to whatever pace scenario unfolds. With the speedy Big Cazanova likely to keep Moreno occupied on the lead, I envision Catch a Flight settling a couple lengths off the pace before rallying to win under Gary Stevens. Now it’s your turn! Who do you like in the great stakes races this weekend?